Saturday 1st October 2016, 12:40pm, 25 miles north of Sparta, Greece. I can see it, it's just there, the checkpoint, there at the top of the rise, about 200 metres away. I'm stumbling towards it, weaving, shuffling, moving slower than a crawl. My legs are shot, they won't respond to my mind's feeble exhortations. It's 33 degrees, but feels like more. I'm being pasted by the sun, burning me from what feels like directly above. There is no breeze, and the heat is radiating off the road, burning me from below. I've lost around 15 minutes of my precious buffer against the race cutoffs just in the last couple of miles, and I know, I know deep inside that this race is over for me. I'm nearly at the checkpoint now, my crew and supporter team are there, though they are not supposed to be. They are trying to encourage me not to stop, they have given so much to this race too, they are so invested in it. I can hear the panic in their voices, my wife Rosie is verging on tears, they are upset. They are not allowed to touch me here, so they can only ask the checkpoint team to help me, they are arguing a little with the checkpoint team, and are told to back off. I ask to sit down, for the first time in nearly 31 hours and 128 miles, I ask to sit down. I think there are a couple of minutes where I make some slow attempts to drink something or cool down a bit, but it's hopeless, all the fight has left me. Everything has left me. It's over. I put my head in my hands, and let the tears come. 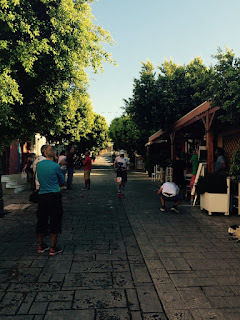 So ended my attempt at this year's Spartathlon, in failure. But before the failure, there was a hell of a lot of good stuff, so i'm going to try to capture as much of it here as I can, because it will help me learn for next time, if there is a next time. And hopefully there are a few people out there who enjoy reading this kind of thing and can learn something, even from a DNF. Sorry for the length of this post, thanks for reading. Friday 30th September, 2016, 7am, the Acropolis. Athens, Greece. This is it, the biggest race of my life, the biggest physical undertaking i've attempted to date. I'm nervous, but not cripplingly so. I'm relishing the challenge ahead, our "war" is about to begin. 390 runners from all over the world crowd the makeshift start line and before we know it we are off and away. My running buddy James and I are quickly separated in the rush of people down the hill and away from the Acropolis, but it's ok, we have plenty of time to get back together. James finished this race last year, and we're aiming to run this one together as much as we can, but with the agreement that we'll split up if we have to. Down into the streets of Athens we go.... finally I am in this race, after years of thinking about it, what a buzz! It is rush hour in Athens, and we are running on fairly major roads. The police do an incredible job of holding back the traffic at major junctions to let the race pass, drivers leaning on their horns at us, whether in frustration or encouragement i'm not sure. James and I hook up for a while and then drift apart again, and I spend some time chatting with other runners. I lock into the same pace as Sophie Power from the British team, and we spend a good few miles chatting away about running, life in London, our kids etc etc. Sophie and I run up the hill out of Athens together at a decent clip, nothing too crazy pace wise though. We are playing leapfrog with Rusty Rusk, also from the British Team, who is adopting a run/walk strategy from the start. On past the half marathon mark and eventually Sophie and I drift apart, and James and I join forces. It's time to stick together and go to work. For the next little while we find our rhythm, keeping a good pace whilst making sure we stay as cool as possible as the mercury is starting to rise. At every checkpoint, we dunk our hats into buckets of water and get a sponge over our heads and necks. Also ice cubes inside our "buffs" wherever possible. We are keeping perfect pace against our plan, and both feeling good. We start going through some oil refineries outside Athens and it's all a bit grotty, but it doesn't bother me too much. At some point we are briefly running with Rob Pinnington, captain of the British team, but he seems to be struggling. James tries to encourage Rob to come with us, but we drift apart from him and James and I push on. Thanks Rob for getting some ice cubes for me at one of the checkpoints there and showing me how to wrap it into a buff. At some points coming out of Athens, there were groups of schoolkids who'd been let off their lessons for a little while to come and see the race. They'd line up along the road for high fives from the runners, which was very cool and a nice boost. I hope they get the chance to run Spartathlon one day, it's a big deal in Greece. Eventually we get near to Megara, the marathon mark and the first point where we can receive assistance from our crew. I have my brother Jeff and best man Garry crewing for me, whilst James has his wife Laura and our mate Jamie Holmes, a man who finished this race last year. Later on Rosie will join us at Corinth as a supporter. The Megara checkpoint is just loads of cars parked up on either side of the road. We have to go across a timing mat so our time can be recorded and then find our crew. Fortunately, Garry is out on spotting duty and he gets hold of us and leads us through the crowds and up to the cars, otherwise it could have been quite stressful. We reach the marathon mark in 4:15, bang on schedule. Our crew treat us, getting us cooled down again and our bottles and pockets restocked. They are well organised and on the case, getting us out of there probably in under 3 minutes. Fortified, we push on. We're into the race now, and it feels great. Part of me had been worried about dropping out for some reason in the really early stages, and having huge regrets. So far that hasn't happened, and i'm feeling good about our prospects. But, the sun is now fully up and it is hot, hot, hot. Time to see if all that sauna training I did had any impact. The course also is now hillier and we have to get up to Corinth, 23.5 miles away, in about 4 hours 35 minutes. It doesn't sound too hard but believe me when I say it's no cakewalk! The bonus here is that we now have some stunning scenery to take our minds off the effort. We are running along the old coastal road with the Saronic Gulf on our left. It is really beautiful, and the quality of the road is very good, so we are able to coast along not worrying too much about our footing and soaking up the scenery. James and I are still in our checkpoint routine of dunking the hats etc, it's working well and we make good time. We mostly stick together, but James is starting to drift ahead in places and having to wait at checkpoints for me. I encourage him to go on but for now he's happy to have a bit of a brake on his pace. James is feeling a bit of stomach difficulty in these stages, but like the true hard as nails northerner he is there is no way this is stopping him. Eventually we get off the coast road and start heading up towards Corinth. There is a huge hill, somewhere around the 46 mile mark I think, which I struggle with a bit and James drifts on. We have plenty of time in the bank though and i'm not worried. Over the hill and suddenly we are upon the Corinth Canal, a huge channel cut through the Isthmus of Corinth to allow ships to pass through and save them going round the mainland. It really is something else, amazing to see. 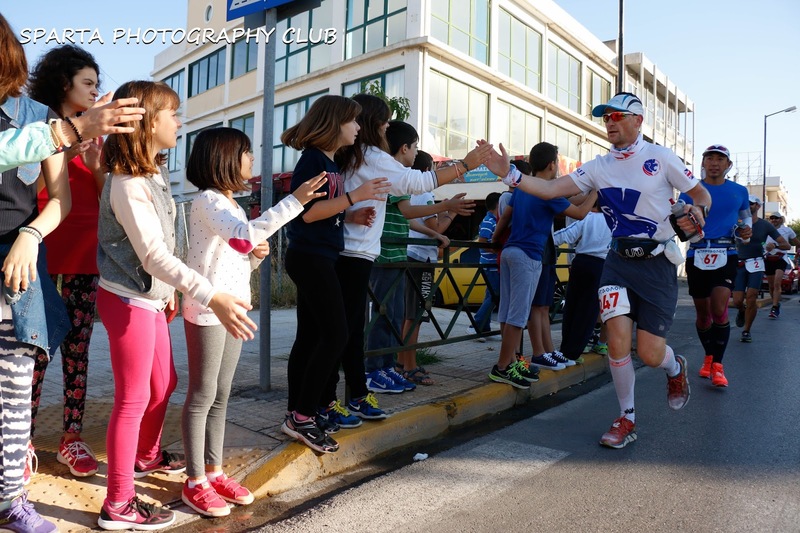 We cross it on a narrow metal footbridge, which is also hosting many spectators, so there is a nice atmosphere. From here it's not far up to the Hellas Can factory, the first major race control point just shy of the 50 mile mark. I am so pleased to have made it this far, i'm feeling good and although the heat has taken a toll i'm really pleased that the preparation work I did has clearly helped a lot. I come into Hellas Can at 8 hours 50 minutes, bang on schedule and 4 minutes behind James, and receive a lovely hug from Rosie who has flown in that morning. She was driven from Athens airport by James' mate Christos, thanks Christos for everything. The crew are again amazing here, they give us what we need, cool us down again, and say motivational words to us. It's very tempting to hang around here, it's all pretty comfy, there are even people lying down having massages, which looks nice. But, no time to rest we must go, go, go, those cutoffs are not going to lie down for a massage! We leave the checkpoint with 35 minutes to spare on the cutoffs, right where we want to be. Out of Hellas Can and off we trot onto smaller, quieter roads. It is still hot although maybe the heat of the sun is starting to wane a little, so that's a blessed relief. We will have a couple more hours of trying to keep cool until the sun really starts to drop behind the hills at around 6:30pm. We are making good progress, and with the added bonus that we will now see our crew much more frequently. Their long night of work is about to begin! Our next target is Ancient Corinth, around 8 miles up the road and we both enjoy the run up to here, with a few walking breaks thrown in, and we gain time on the cutoffs getting our buffer up to around 45 minutes. It's wonderful coming into here, there are lots of bars and restaurants lining the main street and the locals and tourists are out in force. Plenty of clapping and shouts of "bravo" which was a lovely boost. I try to acknowledge each one but it's little more than the lift of an index finger. We see our crew again and they sort us out, and we push on. For the next few miles we run through many old villages. Some busy, most quiet. People sat out on balconies having their evening meal cheer us. What strikes me is the relaxed pace of life here, and that families seem to stick together, there are all ages round the table at a lot of the houses. Not to make it sound better than it was because clearly life is tough for some of these villages, but they did seem to have a great sense of looking after each other. Another feature here was the young kids, often alone or in pairs (not an adult in sight, wonderful freedom for them), who were at the side of the road with plain notebooks and looking for autographs from the runners. I signed quite a few (wonder if they'll look me up online and be disappointed??! ), you could see they really appreciated it so it was hard not to. With hindsight I leaked a couple of precious minutes doing this, so maybe in future i'd just take something to hand to them as I went past. Anyway it was a nice diversion and the miles ticked by without too much trouble, although I did have a sense I was starting to slow a bit. Regardless, we rolled into the next crewing checkpoint, Zevgolation, with a 55 minute buffer on the cutoff and still in good spirits. By this time we'd covered around 63 miles, or over 100km in the metric world, so getting into "pretty big run" territory. Our crew performed their usual Formula 1 team duties here along with giving us our headtorches and I think some warmer clothes, although that may have been later. The sun was really low now and we only had a few minutes light left, also there was no more need for cooling by this stage as the temperature had dropped to a very pleasant high teens. In and out of Halkion and on towards the halfway point at Ancient Nemea checkpoint 35. Somewhere around here it became apparent that James was going to have to go on ahead. Our paces were just a couple of yards different and it wasn't fair to hold him back any longer. I think James had waited a bit at one point but because it was now dark it was difficult for him to pick me out in the glare of other runners headtorches and he was worried I had gone passed him. He didn't know if I was ahead or behind so had to crack on and hope we would sync up again at a checkpoint. Unfortunately by the time we got to Ancient Nemea there was a five minute gap between us, I can't remember if we saw each other there but it was apparent to everyone, including our crew, that we had to do our own thing now. Thanks James lad for those magic few hours together on the road, it was truly epic. On I forged alone, still with a 55 minute buffer on the cutoffs. Although clearly tiring, I was still in high spirits, and I was coping really well with the uphills. In fact I was usually gaining some time on the cutoffs on the uphills (always did love marching up a hill in my youth) so that was all good. The problem though, and I didn't realise at this point just how much of a problem this would turn out to be, was that I was awful on the downhills. You've really got to be good on the downs in this race, because the way the cutoffs are structured they are assuming, rightly, that you will run all of them. After Nemea you go down a fair bit then up another decent hill, and then it's down, down, down for quite a while. You've got to be running this, and I simply didn't have a good time here. It was pitch dark and the roads were by now pretty bad quality. I was worried about losing my footing and turning an ankle, plus my legs, especially my quads, were protesting. Coming down into Malandreni is a long winding downhill that seemed to go on forever. People were going past me, I tried to go with some of them but it just wasn't happening for me at this stage. This was my first major learning point from the race - more specific training for running downhill and more quad work in the gym. I can get a lot better at this and it will help big time. Anyway, I still had time and wasn't unduly worried at this point during the race. If i'd known better I could have seen some writing starting to appear on the wall. On the plus side, it was a beautiful starlit night and I was really enjoying being out there. It brought home to me how great events like this are, taking you to places you'd never go at times you'd never usually be up and about. How much of a departure this is from "normal" life is quite extreme, but in a good way. Even when your body is being slowly broken somehow your soul is being healed. Sometimes I just need that kind of thing. Maybe we all need that kind of thing. That's how I felt, but maybe delirium was setting in! 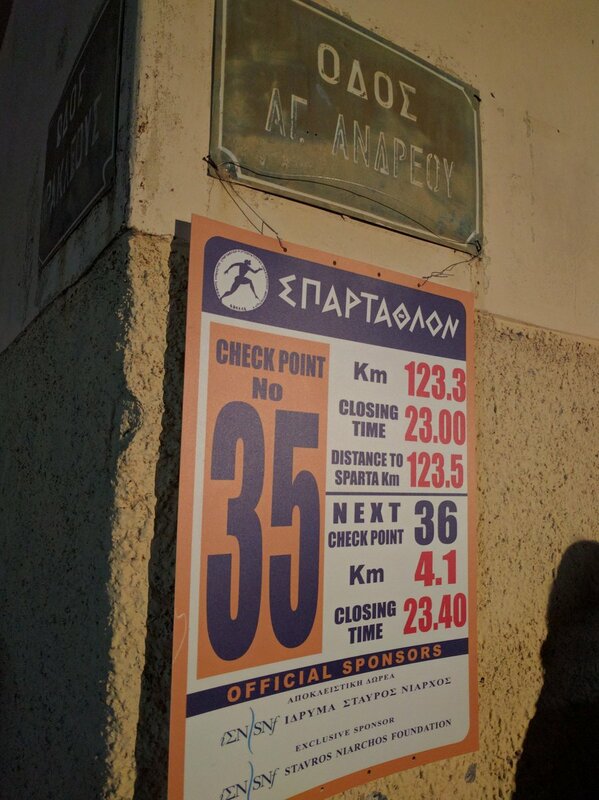 I pushed on, eventually reaching Lyrkia and then beginning the long slog on the road up to Mountain Base checkpoint 47 at mile 99.1. At this point I joined forces with two wonderful chaps - Harry Wurm from Austria and Anthony Lee from the Irish team. We made a quick agreement to stick together and spent an hour or so marching up the switchbacks and having a bit of chat. Can't really remember what we talked about now, to an outside observer it would have been the ravings of three lunatics I imagine, but it helped us and we made good progress. At some point Anthony said "that coffee's worn off!" and boom he was gone off the back of our little group. Harry and I continued, getting almost all the way to Mountain Base together before drifting apart. Into Mountain Base CP47 and I had 39 minutes to spare on the cutoffs. Jeff and Garry welcomed me to the CP but there was little time to stop and rest. They put a jacket on me and encouraged me to get on my way, Jeff repeatedly telling me "get your head down and get over that mountain". Sound advice, ok, I will do it. Now we go off the road and sharp left, onto a mountain track and almost immediately it feels like we are going straight up. The track is rough, lots of loose stones, and it is tough to make progress. It feels like I am crawling, but in fact I do ok. At times I stagger and lose my footing a little, but it is never a hands on knees climb like i'd read about. Don't think i'd fancy it in the wind and rain like the boys had last year though. I made the mistake of ignoring the advice and looking up to see if I could see the summit. This is an error as you get demoralised from seeing all the head torches winding their way up above you, but the flip side occurs as you can look down and receive a quick boost by seeing all the torches below you too. Before I knew it I was popped out at the summit checkpoint 48, i'd done really well on the climb and gained 10 minutes back. I was a pretty happy boy at this point, because lots of reading i'd done suggested that get to the top of the Mountain with around an hour to spare and your chances of finishing the race are very high. I'd stupidly equated that to mean that i'd done the hard part and the rest would be more straightforward. Nothing could be further from the truth but I didn't realise that at the time and pressed on, spirits high. Remember I said I was awful at the downhills? Well coming down off the mountain I also had a bad time, and I gave back that 10 minutes I gained. Going down the track is wider, and it is runnable, but it is very rough and again I was worried about falling or turning an ankle. Bear in mind that by this time it is 5am and the runners have been on their feet for 22 hours! Again I walked most of it, breaking into the very occasional half hearted trot. To be fair a lot of people were doing the same, but there were people coming past trotting, and they would have been saving a few minutes on me. Likely they are experienced Spartathletes, these guys just seem to know the right times when they need to make a push to save a few minutes. Do that in enough places and those minutes really add up. Onwards to Nestani, CP52 and another major milestone in the race. Reach here within the cutoffs and, even if you subsequently drop, this achievement counts as a qualifier for future years. I'd kind of forgotten about that at the time but it was a nice small consolation to take away afterwards. I got into Nestani in 202nd place and with 46 minutes on the cutoffs. My crew led me inside a nice warm building and we made some clothing changes. They also forced some small bits of food down me, I can't remember what it was but it was good. Out of Nestani and Rosie has woken up from a nap in the car, it was nice to see her and she guided me down the steps of the village square and pointed the way back onto the route. It was first light at this stage so a new day was coming upon us and I was still, I think, in ok shape. The next section is pretty flat across the plains of Tegea/Tripoli for a good few miles, and I was hoping to get some time back off on the cutoffs before the final hills. However, I performed badly here with too much walking and not enough running. I just wasn't disciplined enough. As Jeff later said, you really need to get locked in to a strategy here... run 800 metres, walk 200 metres would be great. Or even run 400, walk 100. Just keep doing that consistently and this section would have been fine. But, I didn't, for whatever reason I just couldn't get it going properly, and I was pretty haphazard. I still felt not too bad, but I was slow when I should have been just a bit quicker. Instead of a proper run/walk, I reset my watch at each checkpoint and figured out what pace I need to hit to maintain my buffer on the cutoffs. This was a big mistake. Let the cutoffs get inside your head and they will mess with your head, especially when you are tired and you're not gaining. I should have ignored them, and focused entirely on consistency of movement. Another major lesson. I also had some stomach woes here, and had to nip behind a bush a couple of times. Nothing major but it cost me a couple of precious minutes each time. For a couple of hours there was a weird temperature drop and the sudden appearance of a pretty heavy mist. Later my crew told me they were kicking themselves for us taking off my jacket at Nestani and they were worried about the cold. It really affected some other runners but luckily I don't think it affected me all that much. It certainly didn't get to the shivering stage anyway. I battled on. And on and on and sodding on. Eventually I reached another major control point CP60 at Alea-Tegea mile 121.4. Looking back at the results it's clear just how badly I did over the plains. I dropped 24 places down to 226th and my buffer on the cutoffs was down to 30 minutes. By now there were only 34 runners behind me, and if there wasn't writing on the wall before it was being spray painted on in red letters now. It was around 10:30 in the morning and hot again. Really hot. Really, really, ridiculously hot. My heat training in the sauna had worked a treat for Day 1, but it didn't seem to be helping me now. There was some point around here where I had been reduced to a crawl and it felt like I was completely gone, but I saw my crew and they encouraged me and I got moving again at a good pace. I thought "oh, they've given me a good kick up the backside there and it has really helped". Another major mistake, what they had actually done was get me properly cooled down and that was what enabled my muscles to start working properly again. None of us connected those dots at the time. We simply didn't have the experience, and by this time we were all pretty frazzled. They'd had virtually no sleep either. So to the denouement. Fairly soon out of Tegea you start going up again, this time on a long, brutal climb that takes you all the way back up pretty much to the same elevation as the Mountain Summit. It is truly agonising. It goes on for about 8km and it is utterly relentless, there is no shade and I was wilting under the sun. I wouldn't have any crew support again until CP65, which was 10.5 long mostly uphill miles away. I also was losing my mind, and forgetting to look after myself properly at the intermediate checkpoints. Whilst I should have been dousing water over my head and even pouring it over my thighs (I saw a Japanese guy do this, I thought he was daft, turns out he was doing exactly the right thing!) I simply did not equate the lack of power in my legs with overheating. What happens (I found out afterwards) is that your body has to avoid the danger of your core temperature rising above a certain point, because that means serious illness or worse. Your body will do virtually anything to stop that happening, and one of the things it does is send as much blood as possible to your skin where the heat can be lost to the air. This diverts blood away from the muscles, and stops them working. Movement just isn't important to your body in an overheating situation. If you can get cooled down, blood will flow back to your muscles and you'll get better movement. Like I said before, not knowing how to deal with this was just a complete lack of experience of these kinds of conditions, and it was almost the final nail in the coffin for my race. The absolute final nail was another mental error - I let myself get obsessed about the cutoffs. I couldn't see how I could possibly make it to CP64 within the cutoff, let alone the end. I was trying to extrapolate my feeble pace into checkpoint times and finishing times, and realising how hopeless it all seemed. I thought they would pull runners who are behind the cutoff, but in fact it is not as simple as that. A lot of it seems to be related to your condition and how well you are moving... if you can get yourself back in some kind of condition where you can move at 6.5km/h (a fast walk) then you'll generally be allowed to continue. I still had 15 minutes on the cutoff when I sat down at CP63, so if i'd had the presence of mind to dump a couple of litres of water over my head and thighs I might have been able to get going again. Maybe, just maybe, if I could have made it through the heat of the afternoon and got on the downhill section into Sparta as it started to cool I might have had a chance of a finish. Or maybe that's just wishful thinking and i'd never have made it anyway. I don't know, and never will, for the 2016 version anyway. What I do know is that I learnt a hell of a lot about myself by preparing for and participating in this race. It's a failure sure, but it's one tempered by some satisfaction about getting that far in the biggest race i've ever been in. A lot of the stuff I did to prepare, and a lot of the stuff I did during the race, worked really well. With a few tweaks and more effort on some things throughout the year, I now know I can finish this thing, whereas before I did have a lot of doubt, no matter how positively I tried to think. Not to say something else won't get me on another attempt, but it won't be poor downhill running or poor heat management skills that's for sure. James Ellis, well done big man, proud of you. Another tat on the leg? Sophie Power, great to run with you in the early stages, massive congratulations on your finish with a blown quad. 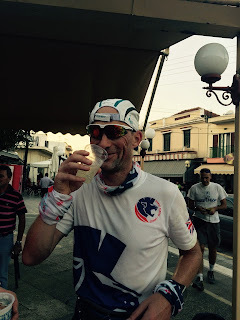 Ian Thomas, the most unassuming, politest, gentle man you could hope to meet, but a running machine. Well done sir on your top Brit finish, I salute you. To all the British finishers, congratulations guys, really pleased for all of you. Especially Rusty Rusk who came back from the dead of Day 1 with a storming night-time and Day 2 performance, powered mostly by watermelon. Well done mate, really great stuff. Bob Hearn, whose blog post from last year taught me so much and from which I nicked quite a few ideas, well done sir on an astonishing improvement from last year. Can't wait to read about how you planned your assault on 2016. Lastly to the elite athletes at the front of the field, congratulations, you guys and girls (especially the girls if i'm honest) are absolutely freaking unbelievable. You should be feted and lauded wherever you go, as an Olympian middle distance star would be, unfortunately our sport doesn't have that kind of exposure. Yet. Thanks for reading, see you "out there". This morning I found myself "discussing" with Gaby about the virtues of running a qualifying time in deepest darkest Holland/Germany in Jan/Feb...all because of you (and with you as I am not doing on my jack!!!!!!). And really because of how inspirationally you've pooped out the other side of your epic Sparta experience with the verve and spirit to "do more". I sat on every word and I've learnt some real gems from your story. Where are the ups and downs in East London??? ?